So many fish, so little time. That became my mantra for a summer spent in southwestern Montana. Arriving in Dillon on May 15th after a 2700 mile trek with Clacka in tow was the start of a trout fishing adventure I could only dream about prior to retiring. A job in a local flyshop was the touch point for this endeavor. Montana had incurred the most severe winter in quite a number of few years. There was at least 10 feet of snow pack in the Pioneer Mountains threatening to blow out most of the rivers in this region of Montana. The potential for this event caused a great deal of angst amongst local guides and outfitters. Heavy rains contributed to this dilemma. The drought in Montana was over. It began to become apparent that the fishing season would lag the normal time table by at least two weeks possibly three. For those out-of-state anglers who had planned trips around the various hatches this would be disastrous. There was one bright spot in all of this weather related impact on the Montana fishing industry. The Beaverhead River. This tail water emerges from Clark Canyon Reservoir and became the go to spot in the southern tier of Montana. Although, the reservoir was essentially completely full the lack of need for downstream irrigation enabled the Army Corps of Engineers to establish a river flow rate that was easy navigable by wade anglers and those anglers in drift boats. The Beaverhead starts at the reservoir and flows to Twin Bridges where it becomes part of the confluence of the Jefferson and ultimately the Missouri River. 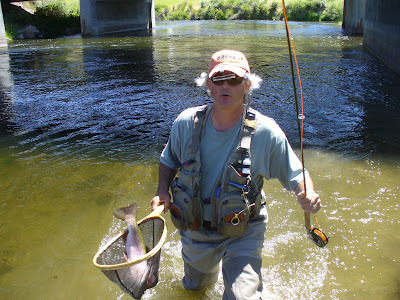 My fishing efforts were concentrated from Buffalo Bridge to Henneberry takeout. I waded and floated both these stretches numerous times and was never disappointed by the size and fight of the wild Montana trout. There were many go-to patterns used on these stretches of water. Primarily small nymphs and streamers were the order of the day. I wasn’t in Montana long enough to see the fish start looking up in great numbers. I will remedy that in the near term. One surprisingly effective subsurface pattern I had never used in Maine was that of a Crane Fly larva. These huge bugs were as long as your little finger and just as thick-they were a huge bite and a deadly combination with a small PT Cruzer or Flashback nymph. The amount of aquatic insect life found in the Beaverhead was amazing. I would kick up some bottom sediment into my sample net and the Yellow Sallie nymphs would literally swarm off of it. Being the geek that I am I filled numerous sample bottles and took them to the shop to show the visiting anglers the types of bugs they needed to match and what would work best. The enormous Crane Fly larva were always good for shock value. If you get the chance to fish this amazing river you should. You will not be disappointed at the size or the number of trout.